Snowflakes coordinates your embryo adoption from start to finish. However, your adoption homestudy and your frozen embryo transfer may need to be completed with other organizations and therefore the costs are variable. Here is some information to help guide you. Snowflakes follows the best practices of adoption and therefore we require that an adoption home study be completed by the adopting family. 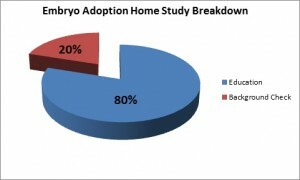 The home study is 80% education and 20% background check. It protects all of the parties involved – donors, adopters and children. Donating families have confidence that the adopting family has been appropriately evaluated and is a safe and loving family. Adopting families receive the education necessary for success in raising adopted children and communicating their children’s unique family origins to them in an appropriate and loving way. Children benefit because the entire process is oriented to their protection – children are adopted, not donated. Nightlight Christian Adoptions has state licensed adoption offices in Southern California, Colorado, Kentucky and South Carolina that can provide homestudy services for adopting families. If an adopting family lives in another state, Snowflakes works with adoption agencies throughout the country to help our adopting families complete a homestudy. These homestudies are completed by an agency in the state in which the adopting family lives. Fees for the homestudy service vary by agency. If you have had a homestudy completed within the past 12 months for a different adoption program, the Snowflakes team can work with you to have the homestudy modified for the Snowflakes program. What is included in a homestudy? The final step in the process of embryo adoption is the frozen embryo transfer (FET). In this medical treatment process the adopting mother’s womb is prepared to receive and nurture embryos that will be thawed and transferred into her uterus. What is included in the frozen embryo transfer (FET)? While the Snowflakes program matches all of a donor’s embryos with one adopting family, the adopting family may desire to matched with a second donor family if a child is not born from the first donor’s embryos. For this service, there is a Snowflakes fee of $2,000.00 to cover the administrative costs of matching, legal contracts, FDA compliance, and shipping for a second donor match.